About: Primocandelabrum, as the name suggests, bears the shape of a candelabrum, with branches that diverge near the base of the frond. This species of Primocandelabrum is found preserved with a basal holdfast which, when found in isolation is termed Hiemalora. Where other Rangeomorphs are thought to have had their holdfasts buried in the sediment, it is thought that P.hiemaloranum sat on the surface of the sediment, with root like structures emanating from its holdfast to hold it in place, making it unique. 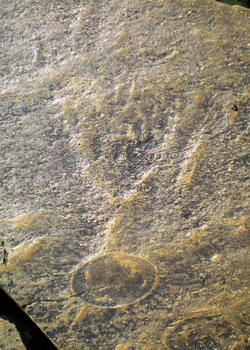 The holotype specimen of Primocandelabrum hiemaloranum described from the Bonavista Peninsula of Newfoundland.